Mission accomplished? Actually, the prototype presented its erstwhile ecstatic creators with an unforeseen headache: how to name a module which was planned as an envelope generator but ended up exceeding expectations by so far? Fortunately for VERMONA, various proposals were supportively submitted to Twitter in response to a small survey. Settling upon fourMative CONTOURS, the company collectively felt that this does not pin down the module’s function to being that of just another envelope generator, but rather reflected its purpose while typically followingVERMONA’s Eurorack module naming scheme. So what warranted the fourMative CONTOURS name, and what, exactly, does this module do differently? First and foremost, fourMative CONTOURS delivers up to four single-phase envelopes that can be combined to achieve much more complex voltage- controlled curves. 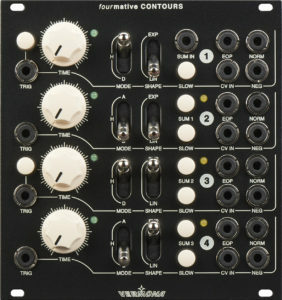 Therefore, the module itself features four individual channels (or units in ‘VERMONA-speak’), numbered accordingly on its front facia. Flexibly, each unit can be switched into A (attack), D(decay), or H (hold) MODE — with the attack and decay phases switchable between operating with a LIN (linear) orEXP (exponential) response SHAPE — and can be used individually or in any combination. Those tasty features alone are enough to set fourMative CONTOURS apart from the Eurorack envelope generator pack, putting it in prime position for handling many modulation tasks. The envelopes themselves are seriously snappy; each unit can run within a TIME range of 0.5 milliseconds through to 30 seconds, switchable between perfectly balanced fast andSLOW speed settings to ensure smooth adjustments, with the former geared towards creating crisp and percussive sounds. Saying that, that’s only half the story here, however, since those fourMative CONTOURS units are each equipped with a CV IN (control voltage input) that not only allows the times to be modulated but also extends them in both directions — down to 25 μs and up to 10,000 seconds, so if a two-hour-long envelope is needed then fourMative CONTOURS can handle it!